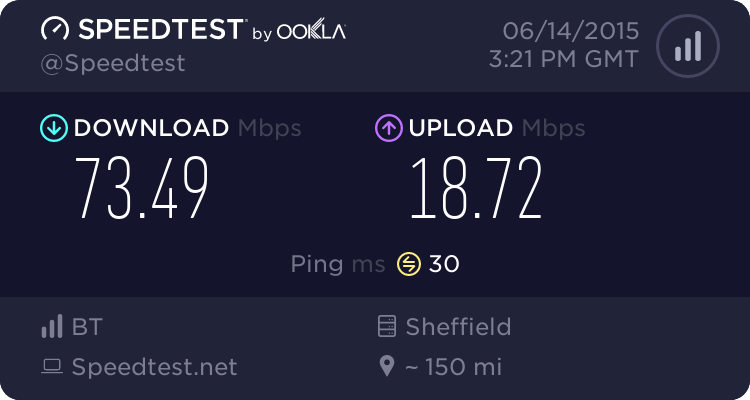 However, when the openreach engineer come to upgrade from the copper broadband to FTTC, he tested the service and said I could only get 40MB download and 2MB Upload. 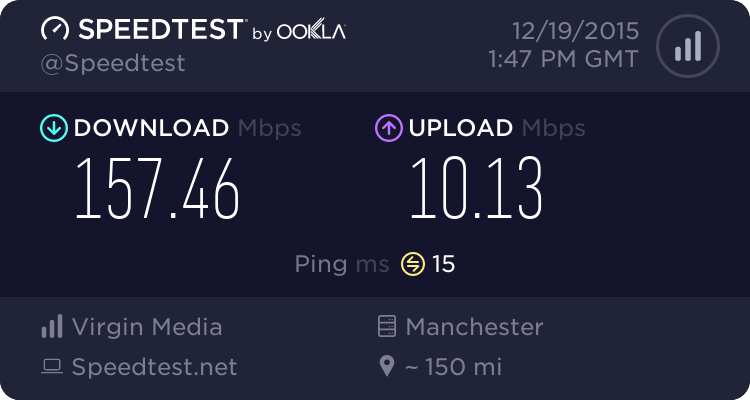 This is more a less what I am getting on the speedtests on the computer (35.53MB down and 1.83 Up). I am completely shocked with the 2MB upload speed. Something has to be wrong with the connection either here in the home or in the cabinet. I can't understand that I only get 2MB upload when I should get at least 7 times that. The cabinet is just down the road, no more than 400m from the house. I really need a faster upload and I bought this house because the expected speeds where much higher. I do a lot of photography work and I need to do massive uploads to the cloud. Does anyone know what might be the problem and what I can do to try to sort this out? Any similar experiences here on the forum? Many thanks for your help. Really Appreciated. Please post the line stats available from the Homehub 5 web GUI in Troubleshooting > Helpdesk. 400m? Can you trace it out with some accuracy, assuming you know te cable routing. From house, to pole, to pole ... to PCP AND then to the fibre cabinet. At 400m you should be seeing full 75+ Mbps on a good quiet line and even on a noisy line, 60Mbps. As Batboy asks - a full set of stats will tell a lot. You may have been pout on a 40/2 profile in error. Either a 40/2 IP Profile, or more likely the port at the street cabinet DSLAM has been configured wrong, or the order from BT Retail was placed wrong. The line stats should resolve this as they'll be nailed to the maximum speeds possible on that port configuration if its a dslam issue. It's worth running this BT Wholesale test. The down and up IP Profiles are what we need to know. The UP one in particular tells us which FTTC product you are on. Many thanks for all your replies so far. I can't be sure about the cable routing but the cabinet is around 400m almost straight down the road, so i can't imagine cable routing being much more than that. The line stats are below. Any help is really appreciated. Thanks. I have just done this test. It seems my IP profile is wrong but you certainly will now more than me about this. Results below. Let me know what I should do to sort the problem. Many thanks. For your connection, the acceptable range of speedsis 20 Mbps-38.72 Mbps . Your latest two posts confirm that you are capped at 40/2 - as I predicted. These stats suggest you should be seeing sync speeds of 64.5/20 with throughputs of around 60/18. Not wrong, but also very wrong. Just what I was looking for. On an FTTC connection, with a few exceptions the upstream IP Profile tells us the Openreach product you are on. It is not determined by the connection speed like the downstream is, but is fixed at the maximum for the product. Infinity is not one of the exceptions. The Openreach products are 40/2, 40/10 and 80/20. Therefore you have been put on a 40/2 connection and it isn't to do with any restrictions within the BT Retail system. As MHC says, in conjunction with the line stats you have also posted, which tally exactly with the maximum sync's in both directions for that product, there is no doubt. Many thanks for your replies. If the problem is with the IP profile Openreach put me on, how can I change this? It is always a nightmare to contact BT retail and it takes ages to sort something out. I was waiting for BT Infinity 2 for more than a month because the system kept cancelling my order automatically due to data integrity issues or whatever they called it. Let me know what is the best way to proceed to sort the IP profile problem. Many thanks for your help with this. It is greatly appreciated. It's BT Retail I'm afraid. That's who your contract is with. I'm not sure what the number BatBoy have given you is, but he is usually right on this sort of thing. confirms that your line is roughly 400m long. Will depend on the gauge of copper used! I called this number and they transferred me to the orders team. My order is shown as complete for openreach and failed for BT, so I have not been put yet on the BT infinity 2 package on BT system. Can this be causing the problem? The problem with this BT order has been going on since Nov 20, always cancelled or freezing for no clear reason, this is yet another chapter. If the problem is with the IP profile, can any of you please explain how this is sorted out? Is it something that can be done remotely or an engineer has to come to the cabinet again? I am trying to understand how long this will take and the amount of pain I will have to endure to go through this with BT. Many thanks again. Without all your help, I would be completely lost! Once the order is sorted out properly the records SHOULD automatically go through to BT Wholesale/Openreach to tell the software to allow you to sync at the higher rate without the need for an engineer. The problem isn't the IP Profile. That and the stats were just info that told us the "Product profile" somewhere in the system is incorrect. As the order team have now sort of confirmed, in that it is set to a default that should be updated once the order is properly completed.